One way to look at the suppliers mentioned on this page is to think of them as "highly unlikely sponsors of Microwaves101". Good thing for the rest of the world that we aren't all about money here! Microwave amplifying devices that are unconditionally stable (k>=1) from DC to light usually have internal stabilization. But stabilizing, especially over wideband, with a series or a parallel resistor as described in the oft-quoted Besser paper "Avoiding RF oscillations", (AM&W, Spring 95) will either degrade the noise figure or P1dB depending on whether connected to the input or the output. So, an "unstabilized" transistor permits the designer to choose which parameter to tradeoff. It also has the flexibility to tailor the degree of stabilization to the application conditions - e.g. a potentially unstable device may become stable after assembly on a paper phenolic FR2 PCB because the substrate loss rolls off the high frequency gain. Additionally, unconditionally stability should not be made a prerequisite for marketing a device because only a subset of amplifying devices will be interfaced with a bandpass filter or an aerial with poor out-of-band match. 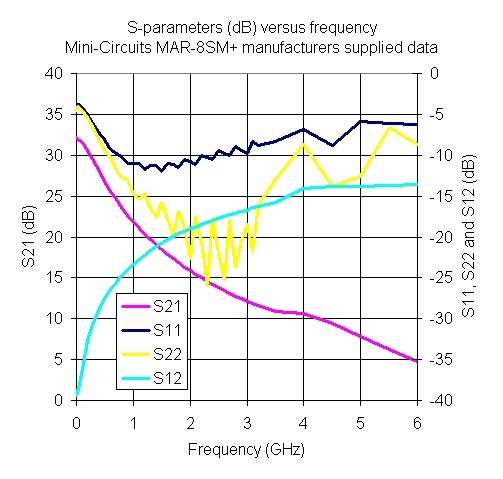 Specifically, the discussed "Mini-Circuits MAR-08SM" was originally envisaged as a wideband gain block; i.e. to be inserted between other stages, e.g. CATV-SATV IF amplifier. 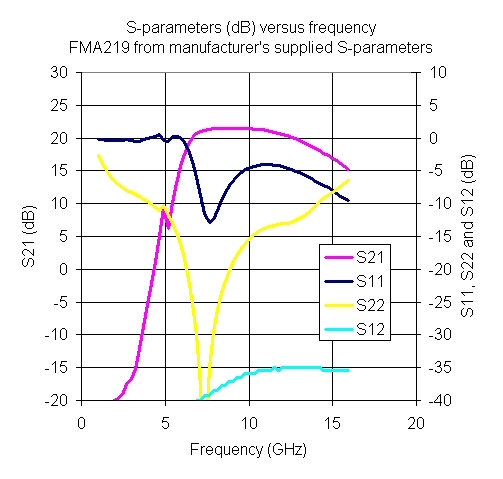 According to the 1993 Hewlett Packard product brief AN-S002 "MODAMPâ„¢ MMIC Nomenclature" (page 2, under "Special Purpose"), the MAR-08/MSA-08 "trades unconditional stability for gain, high frequency, and low noise". Unconditional stability is also not required for another of MAR-08/MSA-08's demonstrated application as a C-band TVRO self-oscillating mixer (see 1997 Hewlett Packard appnote AN-S005 "Using Hewlett-Packard MSA Series MMIC Amplifiers as Frequency Converters"). 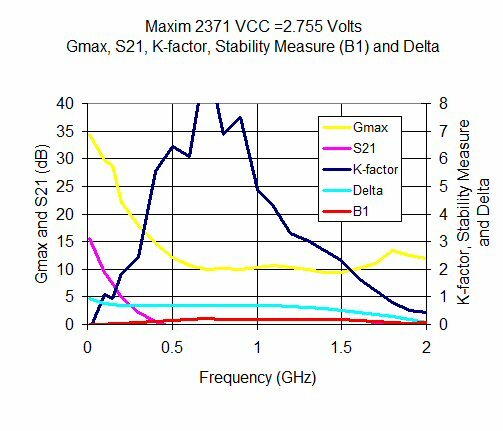 It is always good practice to look at an amplifier's available gain and stability (K-factor) before you use it. This is a check for conditional stability; just because K is less than one doesn't necessarily mean you will be chasing spurious oscillations in your design, but why tempt fate when there are ton of unconditionally stable designs out there. 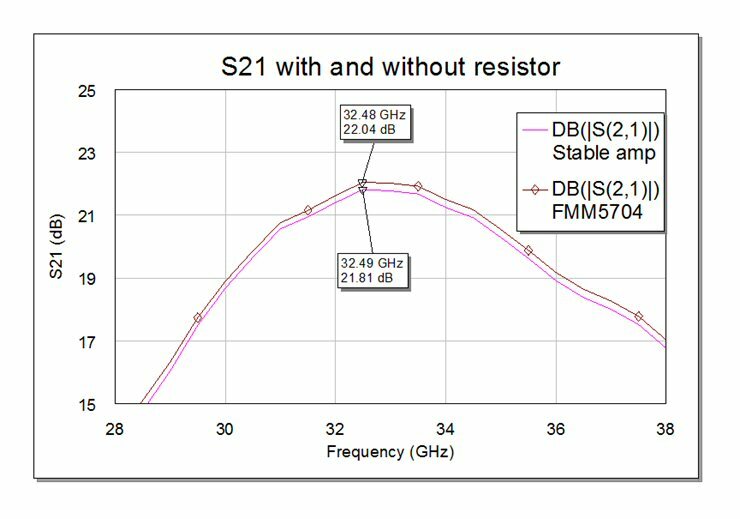 Conditional stability usually doesn't present a problem when the manufacturer takes RF probe data for the data sheet, RF probes present almost ideal load impedances to the DUT over a very wide band. Trouble may arise when you put the device into an actual circuit where you might just want to follow it with a bandpass filter for example. Filters have high reflection coefficients outside their passband, and soon the "fun" starts. Here's a bone worth picking. In spite of all the certifications that companies go though to verify their procedures, like ISO-this, CMMI-that and "Six Sigma", you'd think that an amplifier vender would have a procedure in place to verify that every design that they sell is unconditionally stable, at least in the samples that they measured to provide data to customers. The examples shown on this page are evidence that such a procedure is lacking, even at some well-known and respected suppliers. If we were on their board of directors, we'd make it happen and eliminate this constant source of completely preventable grief. Please don't call us to complain about us displaying your products' faults, call us to thank us and then take them off the market or redesign them, this is a club you don't want to be in. Good grief, Charlie Brown! Almost all of the plots on this page were created using the Microwaves101 S-parameter Utility Excel spreadsheet that you can download for free. Always do the right thing... never use a potentially unstable amplifier! The FMA219 has been kicking around for more than a decade. 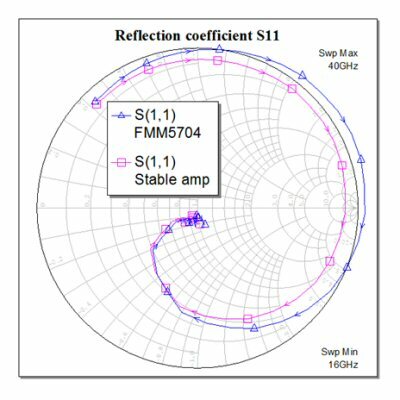 It's a pHEMT two-stage low noise amplifier that provides remarkably flat gain response at X-band. Originally a branded a Litton Solid State LMA219B back in the previous century, it was passed across the Atlantic to Filtronic and became the FMA219. Not long ago RF Micro bought the Filtronic fab and product line and they still market this device but maybe they have never fully examined the "performance" of it. Over the years the S-parameters that have been posted by the manufacturers on this device may have changed a few times, so we recently went to the RF Micro web site and downloaded the data sheet. They don't make it easy to evaluate the part, there are no downloadable S-parameter files for it on RFMD.com, only a pdf document where the data has been pasted in as an image and can't be processed into numbers. We typed the data into a spreadsheet and checked it all (our optical character recognition software seems to be missing in action); what a great way to spend a couple of hours. If anyone wants the data in Excel format shoot us an email and we'll save you the aggravation. 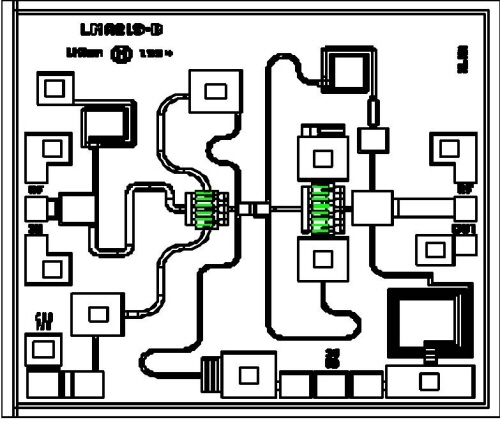 If you look closely, the image that is on the most recent datasheet says "LMA219B" which was Litton's original designation for the part. In any case, below are the S-parameters plotted in dB using our S-parameter Utility Spreadsheet (very cool free download). The parameter that should set off a mental red flag is S11, which exceeds unity below 6 GHz (>zero value when plotted in dB). Here comes trouble! Below we plotted K-factor and maximum available/maximum stable gain for the FMA219B, using our all-powerful spreadsheet. 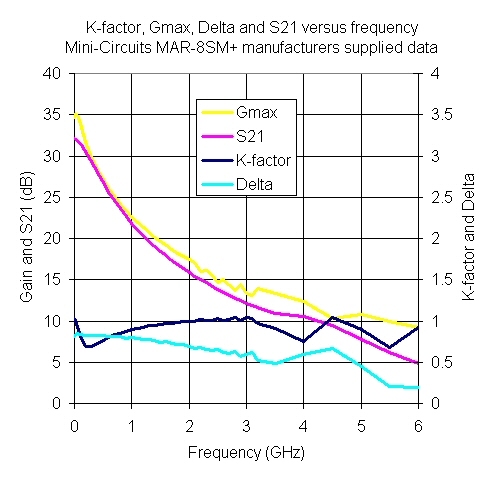 K-factor dips well below 1 twice between 4 and 6 GHz. 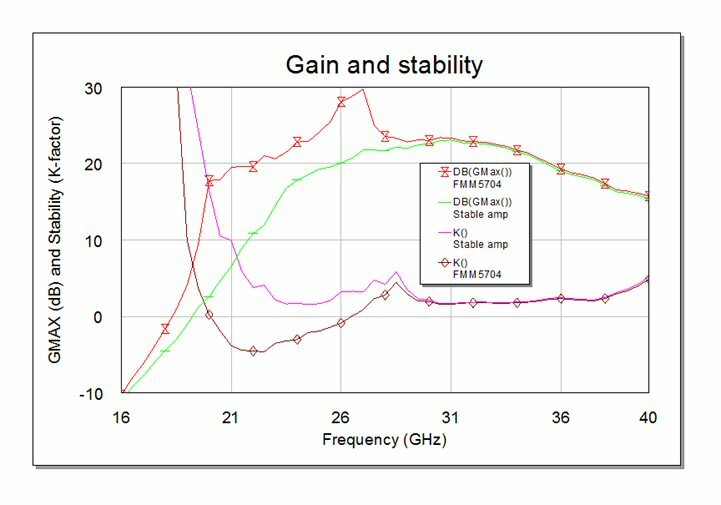 Look at all the available gain that is possible at these frequencies... it's a good bet that this puppy is going to oscillate if it doesn't see exactly fifty ohms between 4 and 6 GHz. 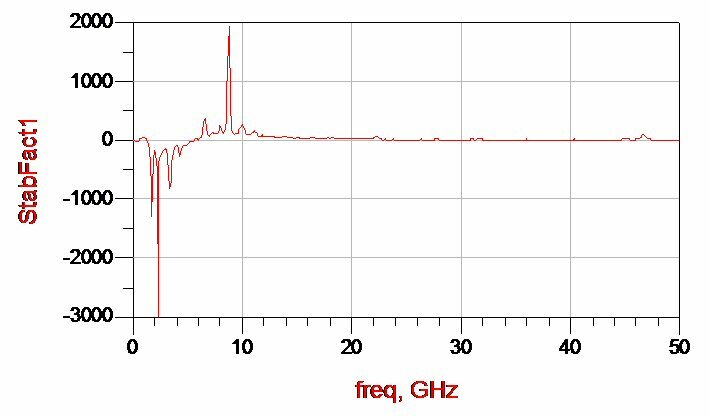 Apparently the FMA219 remains stable (doesn't oscillate) when it sees fifty ohms at all frequencies (like when the manufacturer RF probes it.) For applications where the device is configured in front of, or after a bandpass filter (like it might in a receiver application), don't even think about using it. We speak from experience. Please see relevant comments at the top of this page, Mini-Circuits warns uses that this device is conditionally stable. This circuit is a Darlington pair that uses "silicon technology" which might mean SiGe but you can't tell from the data sheet. Pieter tipped us off to the potential stability issue of this device but we have no firsthand experience with it. Below are the S-parameters, thankfully Mini-Circuits provides a text file that you can easily convert to Excel format and enter into our Utilities spreadsheet. The measured data shows a mess of bumps, could it be that the part is oscillating when MC collected the data for the data sheet? 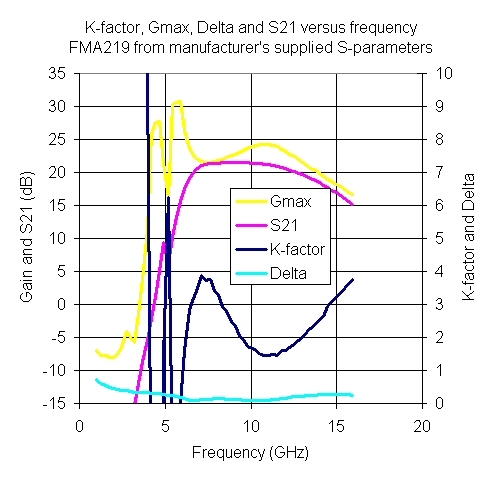 Here's the best illustration of the problem: the K-factor dips below 1 across a wide frequency range. Good luck using it! We received this tip from an engineer in a country in Europe that is famous for beverages created from malted barley. Danke! This circuit is a "high dynamic range GaAs InGaP HBT 1.6 Watt MMIC power amplifier operating from 0.4 to 2.2 GHz and packaged in industry standard SOT89 packages" according to Hittite. It is also conditionally stable, and we have heard that it often blows up just as it is turned on. You probably won't get that information from the data sheet. Note that stability is also a function of bias point. Your design might be stable at the manufacturer's recommended bias point, but the act of turning it on sweeps it through a range of current and voltage, and at some bias point the stability may be a lot worse than at the operating point. Here's the S-parameters. We want to thank Hittite for posting an "S2P" data file of the S-parameters for this circuit and many of their other MMICs, which is easily converted to Excel. It's a stretch to call this an "amplifier", it's really an unmatched transistor. 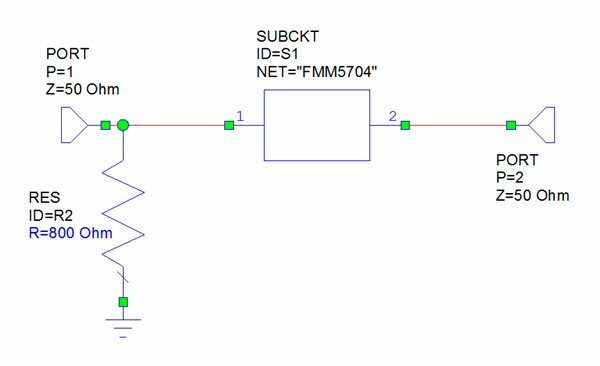 You need to follow the directions on Hittite's data sheet to build matching networks and bias circuitry from SMT components. Here's the available gain and K-factor. It's conditionally stable around 100 MHz, and just barely stable over it's entire band. It also has a ton of available gain right where it is conditionally stable, not a great combination! Our advice is, if you have to use it, put some resistance in the matching or bias circuitry. Better still, pick another part! Finally I solved the stability problem. The destructive oscillations in the VHF range are fixed now. It was necessary to add some loss to the DC bias coil. I used a 100 Ohm parallel resistor. It´s a compromise between damping and system gain reduction. 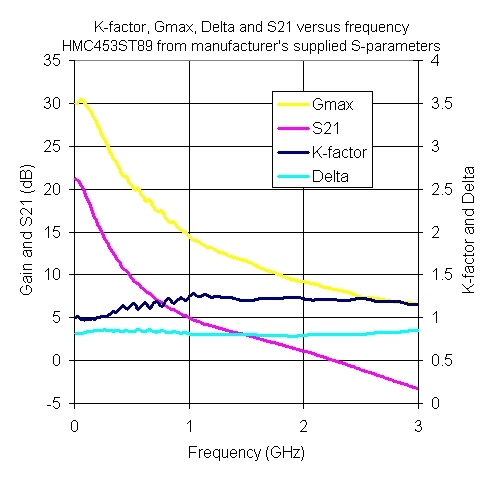 The system simulated stability factor was now K>1 for all frequencies. The measurements showed the same. The broad and unconditionally stable performance makes this LNA ideal for primary, sub-sequential or driver low noise gain stages. Intended applications include microwave radios, 802.16, automotive radar, VSAT, and satellite receivers. Good one, guys. 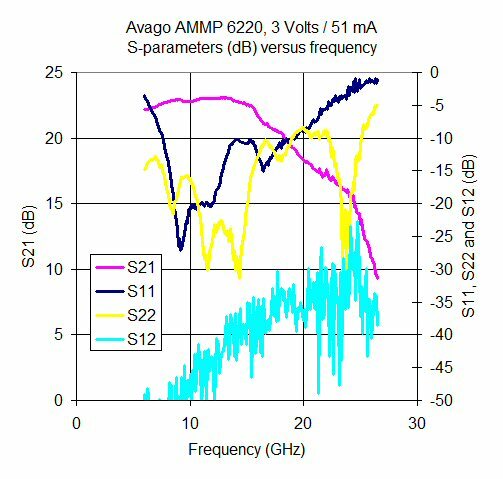 We took a look at manufacturer's supplied S-parameters for the AMMP 6220 (below). There seems to be a lot of noise on the measurement. 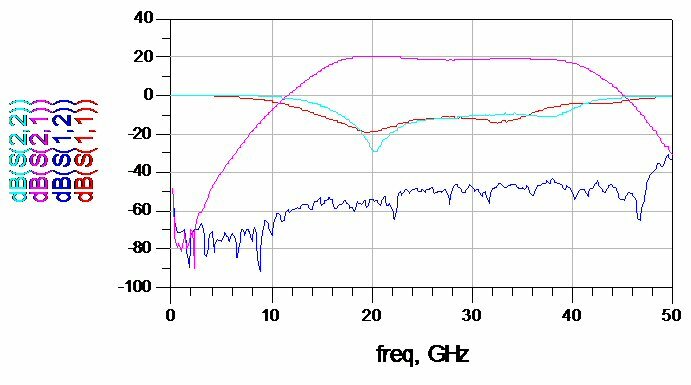 You'd think that Avago's cousins at Agilent would have taught them better measurement techniques... and where is the data below 6 GHz? Is there a reason they chose to hide it? I have built about 50 receivers using this part and had six to date ring like a bell at 26 GHz, with a "fairly" well matched output (definitely better than 2.5:1 at any rate). Obviously the amp runs super hot in this mode -- two burned up completely. It is very difficult to kill the ringing. I'd prefer to kill the guy who specified these - but hey, that's illegal. Cure is to eat the slightly higher power consumption of the AMMP-6222, which is unconditionally stable but has slightly lower operating frequency range. I wonder if the '6220 is merely an under-biased 6222. Good luck with that... and thanks for sharing! 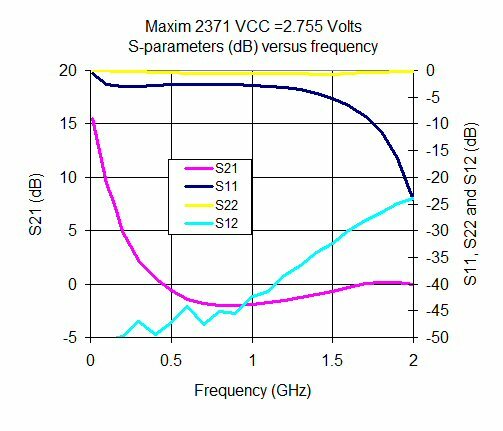 The MAX2371/MAX2373 wideband low-noise amplifier (LNA) ICs are designed for direct conversion receiver (DCR) or very low intermediate frequency (VLIF) receiver applications. They contain single-channel, single-ended LNAs with switchable attenuator and automatic gain control (AGC) intended as a low-noise gain stage. These devices provide high gain-control range (typically 60dB) at radio frequency (RF) with excellent noise and reverse isolation characteristics. What they don't tell you is that the part is conditionally stable. It turns out that this is really not an amplifier in the true sense of the word, it requires an extensive pile of off-chip parts to match it at a a particular frequency which you will discover if you look for an app note. One of the parts is a resistor, which we guess is need to stabilize the "amp". Here's the S-parameters of the device by itself. Neither the input nor the output is matched to fifty ohms. Not that the data sheet or web site even mentions what the system impedance is supposed to be (could it be intended for 75 ohms? Trust us, it would stink at any system impedance. 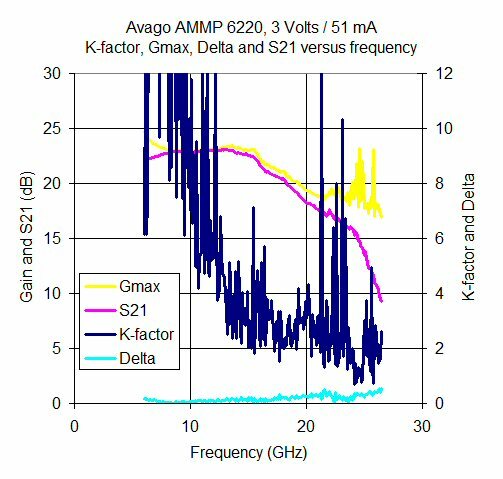 Below 100 MHz and above 1750 MHz the K-factor dives below unity, and the circuit has a mess of low available frequency gain that likely spells trouble. This is a wideband amplifier. Unfortunately it is very sensitive to what it sees on the output, below the operating band. Contact us if you want to learn how to solve this problem, otherwise pick a stable amplifier! Let's zoom in on the reflection coefficient down at the low end where both S11 and S22 look like unity... indeed, they both go slightly above one, a telltale sign of an unstable design. Could that just be measurement error? 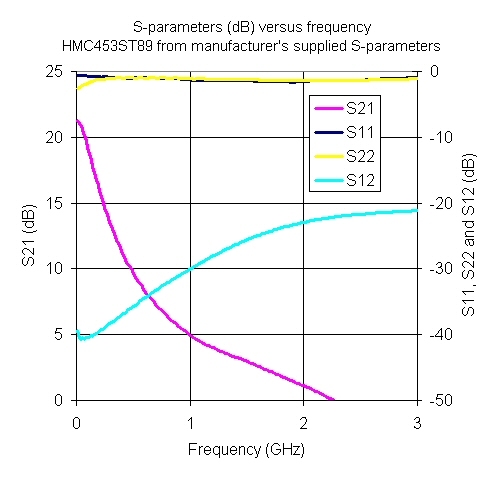 Not likely, S-parameters measurements at low frequency are typically very accurate. So, what does K-factor look like? Not good... actually, horrible. Available gain spikes up below the band. If you use this amplifier in a real system, you will be lucky if it doesn't oscillate. But in a pinch, it can be stabilized with a shunt resistor. Guess which RF port needs to loaded? It's supposed to be a power amp, so loading the output port will cut down the power. Too bad. Murphy's Law applies in this case. Try about 600 ohms. In this example, we have added a shunt resistor to the input of the device to stablize it. The FMM5704 is a Ka-band LNA, obviously adding resistance to the input will increase noise figure, but you have to do what you have to do. Adding a resistor to the output did nothing to improve stability. Before we get any comments about "real world resistors", we added some inductance to the resistor model, and it still made the indicated improvement. Eudyna is now part of Sumitomo Electric Industries (SEI), and they still sell this part. Below is the schematic of the "stable amplifier" which is the two-port measured S-parameters provided by the manufacturer, stabilize with an 800 ohm resistor. 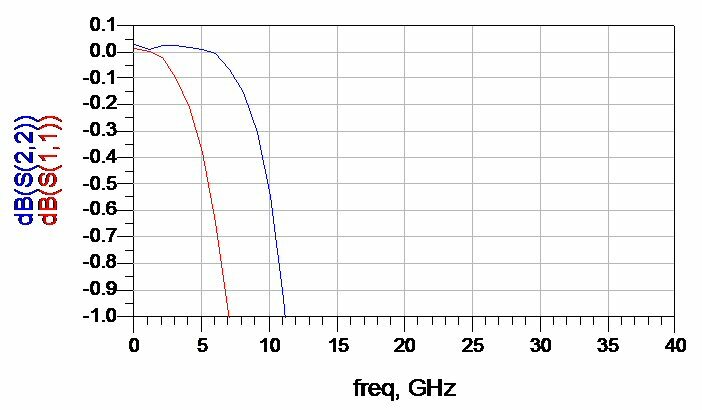 Below is the maximum available gain and stability factor (K) of the amplifier, with and without the resistor. Note that the resistor brings K>1 everywhere (or at least across the S-parameters that were available.) That nasty-looking peak in available gain disappears too. 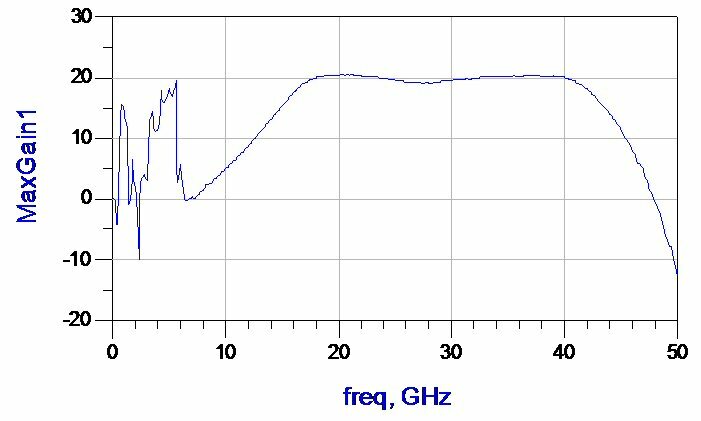 In the close-up below you can see how the gain (S21) of the amplifier is reduced by about a quarter of a dB. You can expect an equivalent increase in noise figure, because we did the dirty work on the input. The reflection coefficients below show another indication of instability and its cure. 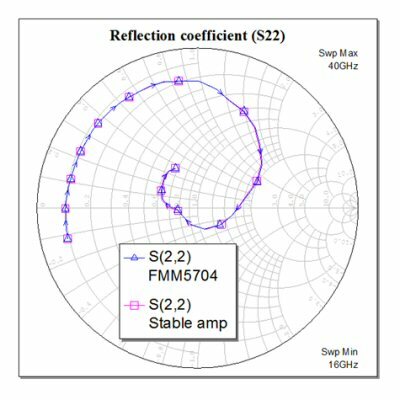 The FMM5704 spins outside the Smith Chart. Adding the resistor corrects that. S22 was fine without the resistor, and is unaffected by it. Do you know of a commercially available part that is conditionally stable? Send us the info and win a cool pocketknife!